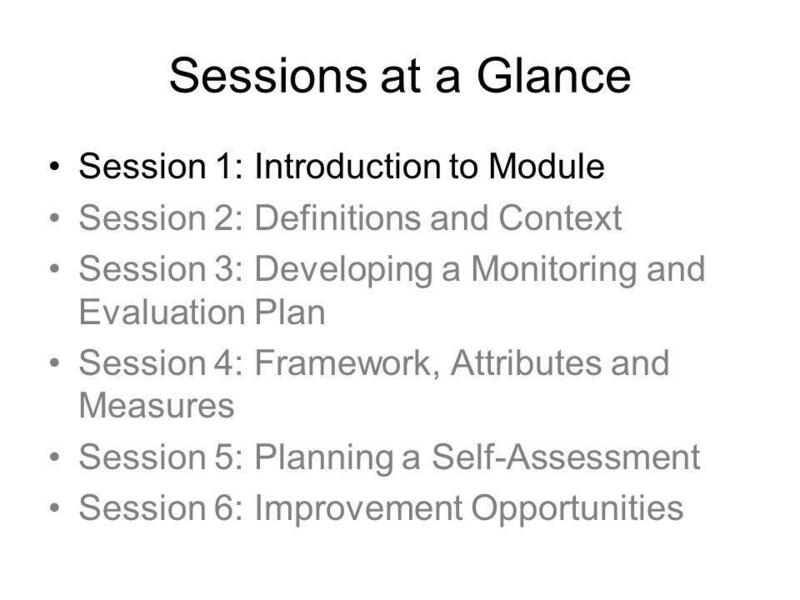 Module 8: Monitoring, evaluation and learning – for increased impact and improvement of the IEA process. 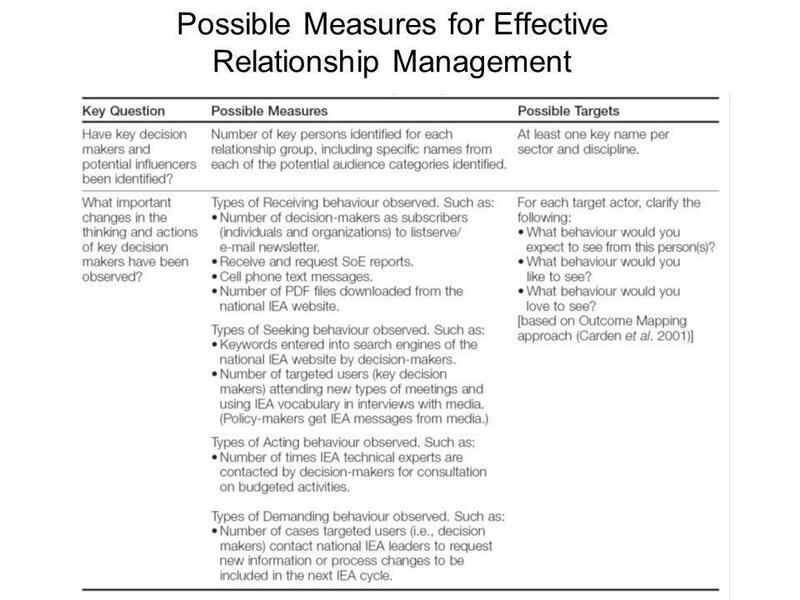 Discuss with your neighbour (10 minutes) When have you been involved in an evaluation/monitoring process? What were some of the keys to success? What were some of the challenges? Discuss in plenary (20 minutes) Your stories, key elements of success and key challenges in plenary. 4 Monitoring Defined Monitoring is a planned, systematic process that closely follows a course of activities, and compares what is happening with what is expected to happen. 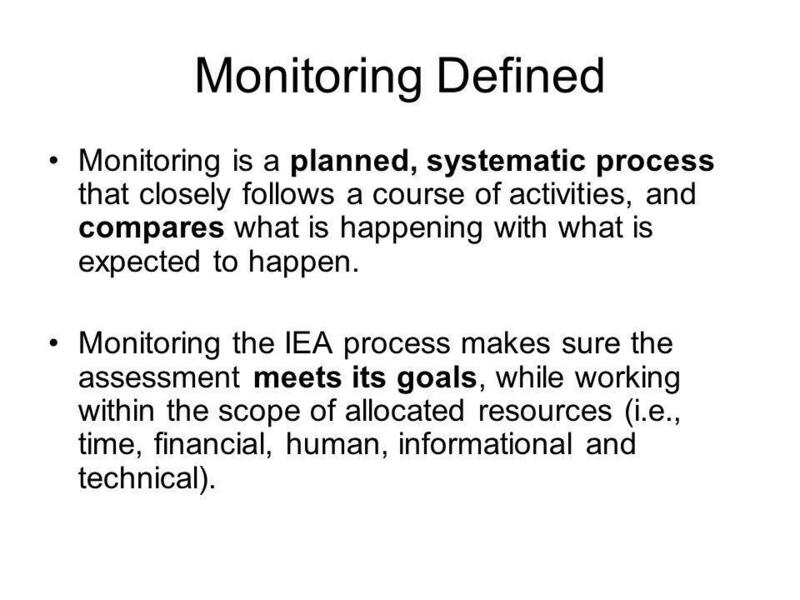 Monitoring the IEA process makes sure the assessment meets its goals, while working within the scope of allocated resources (i.e., time, financial, human, informational and technical). 5 Evaluation Defined Evaluation assesses an achievement against preset criteria. Evaluations can have a variety of purposes, and follow distinct methodologies (process, outcome, performance, etc.). 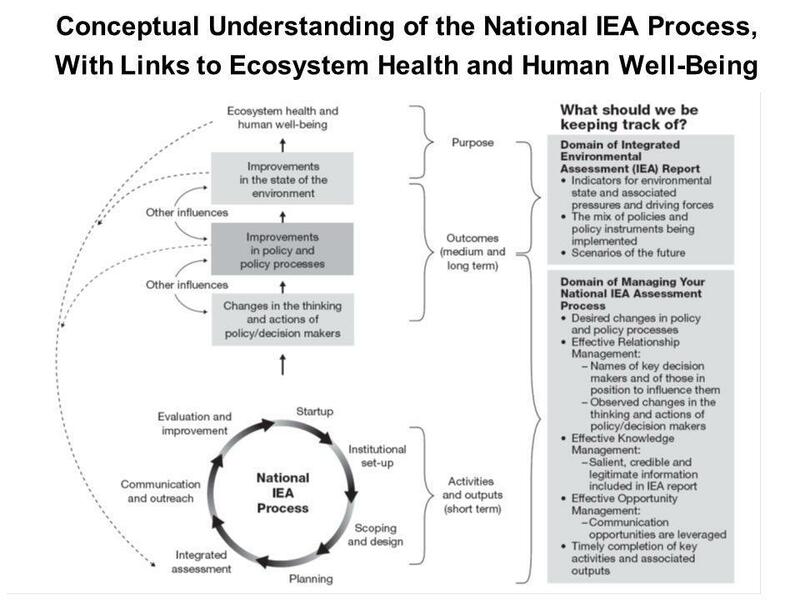 Evaluation of the IEA process determines the extent to which achievements (outputs, outcomes and impacts) are comparable with the originally intended purpose, and what lessons can be learned for the next environmental assessment and management cycle. The evaluation of the process is, first and foremost, a capacity-development opportunity. Collecting data Sense of progress Present time Attention to details Inspires motivation Occurs continuously Requires management skills Asks: What needs to happen now to achieve our goal Evaluation Assessing data Sense of achievement Past / future time Attention to bigger picture Inspires creativity Occurs intermittently Requires leadership skills Asks: Have we achieved our goal? Can we do better next time? 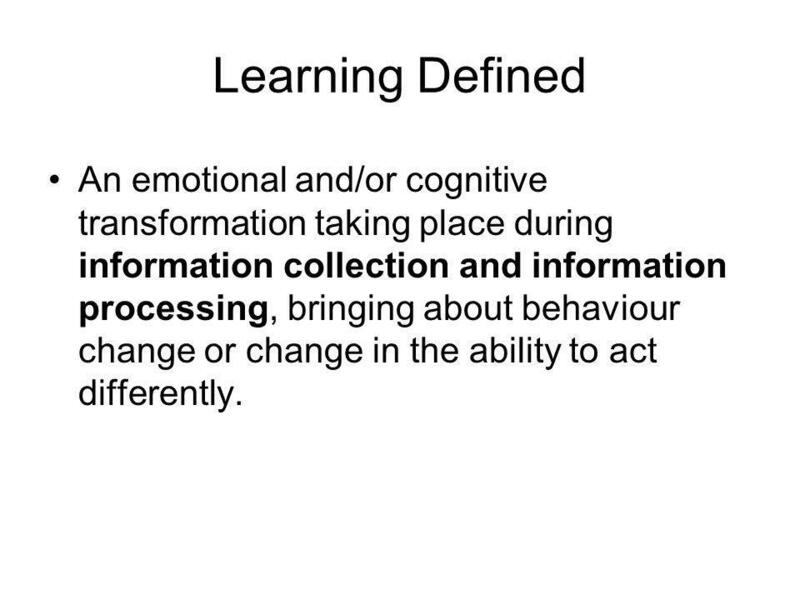 7 Learning Defined An emotional and/or cognitive transformation taking place during information collection and information processing, bringing about behaviour change or change in the ability to act differently. 1. What is the purpose of the evaluation? 2. Who will use the evaluation results? 3. Who will do the evaluation? 4. 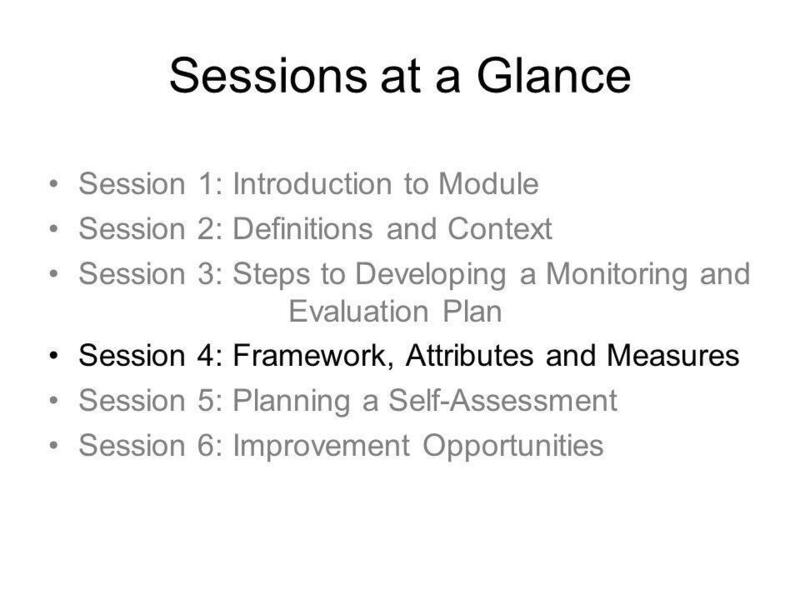 What evaluation framework is practical? 5. What needs to be monitored and evaluated? 6. 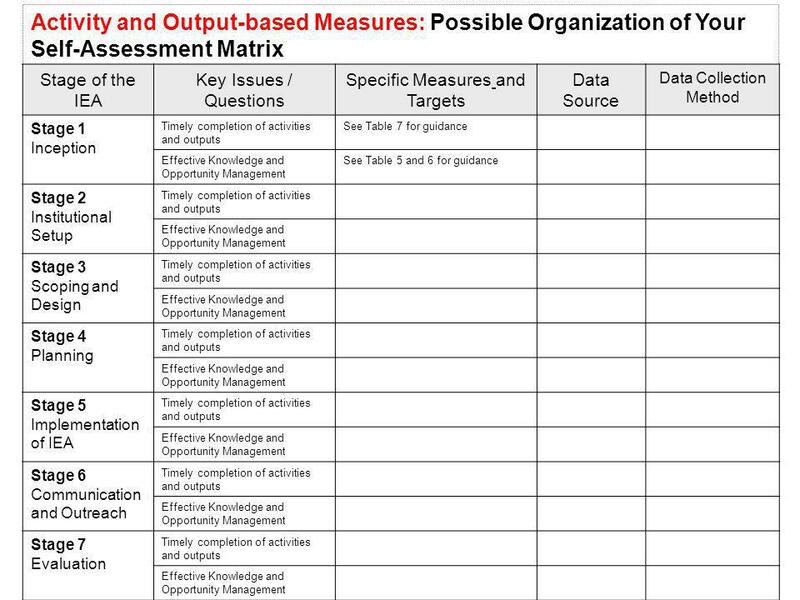 What are the steps to develop a self-assessment matrix? 7. 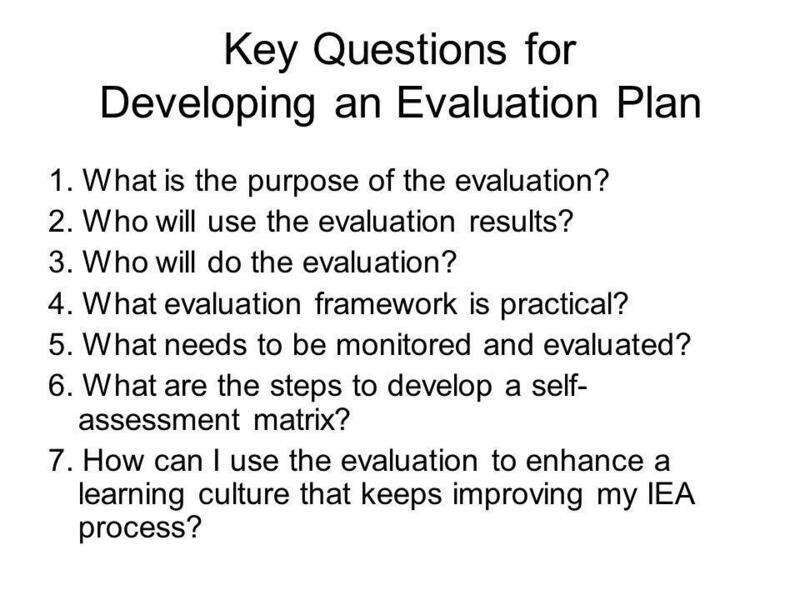 How can I use the evaluation to enhance a learning culture that keeps improving my IEA process? 12 Why Monitoring and Evaluation? 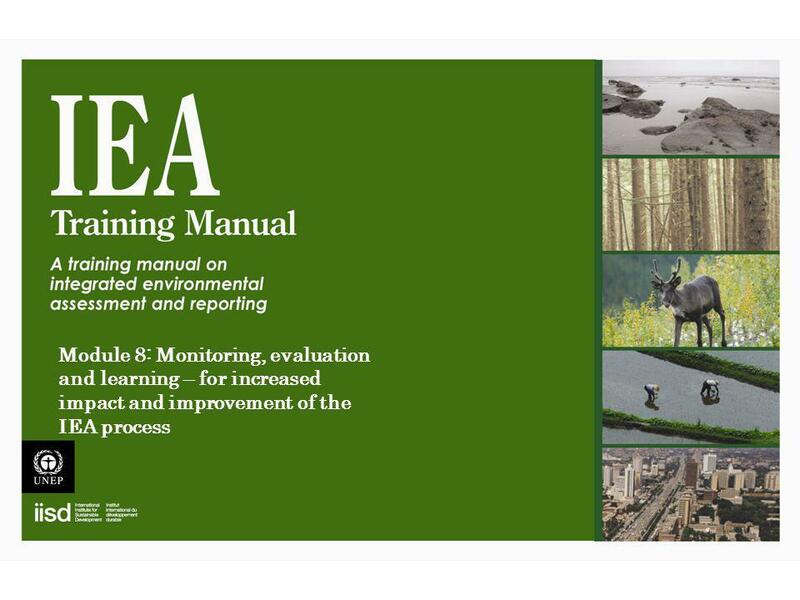 Lessons learned from IEAs help improve policy making processes, policies and state of environment. 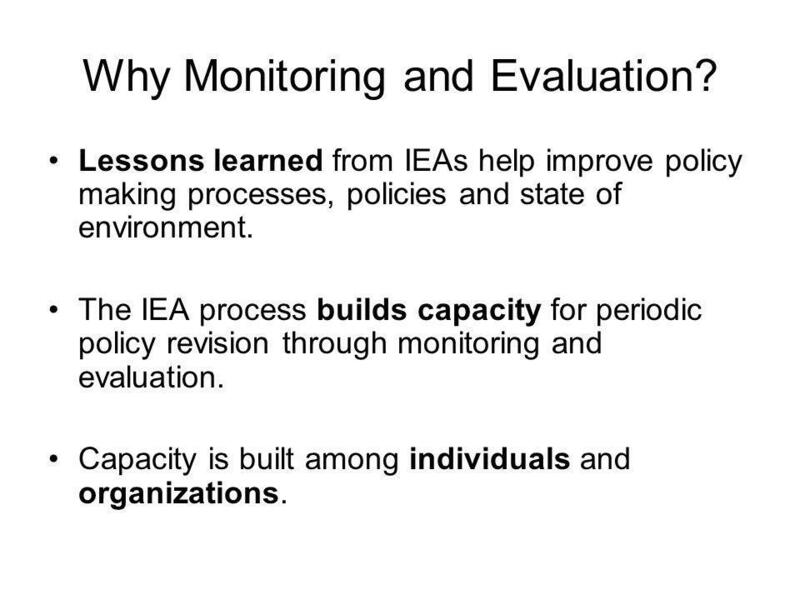 The IEA process builds capacity for periodic policy revision through monitoring and evaluation. Capacity is built among individuals and organizations. 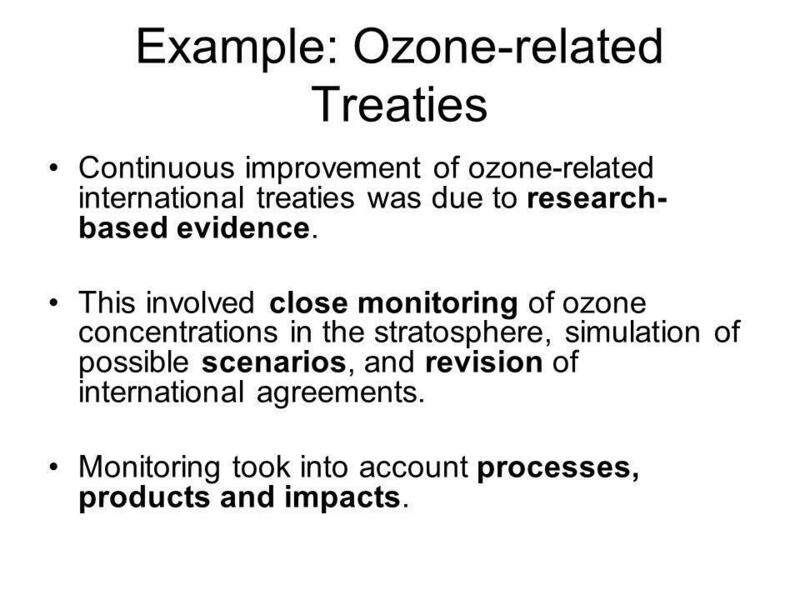 Continuous improvement of ozone-related international treaties was due to research-based evidence. This involved close monitoring of ozone concentrations in the stratosphere, simulation of possible scenarios, and revision of international agreements. Monitoring took into account processes, products and impacts. 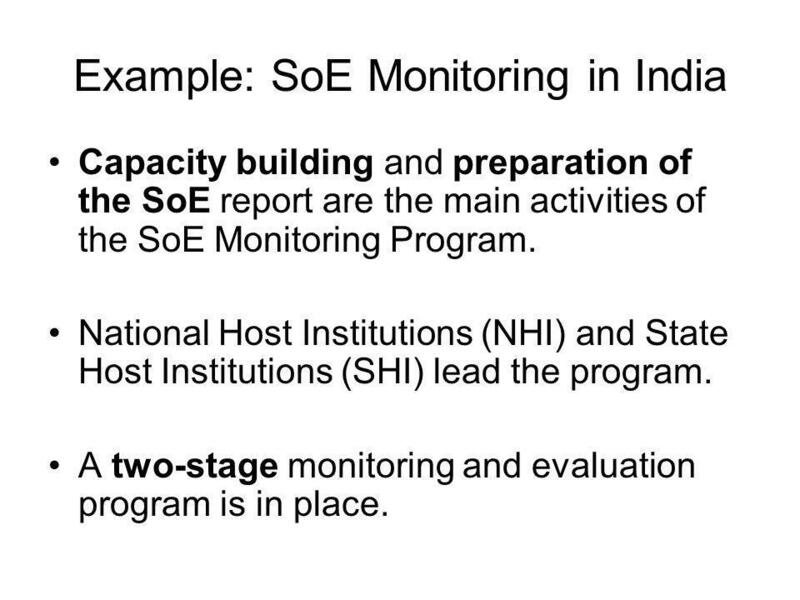 Capacity building and preparation of the SoE report are the main activities of the SoE Monitoring Program. National Host Institutions (NHI) and State Host Institutions (SHI) lead the program. A two-stage monitoring and evaluation program is in place. 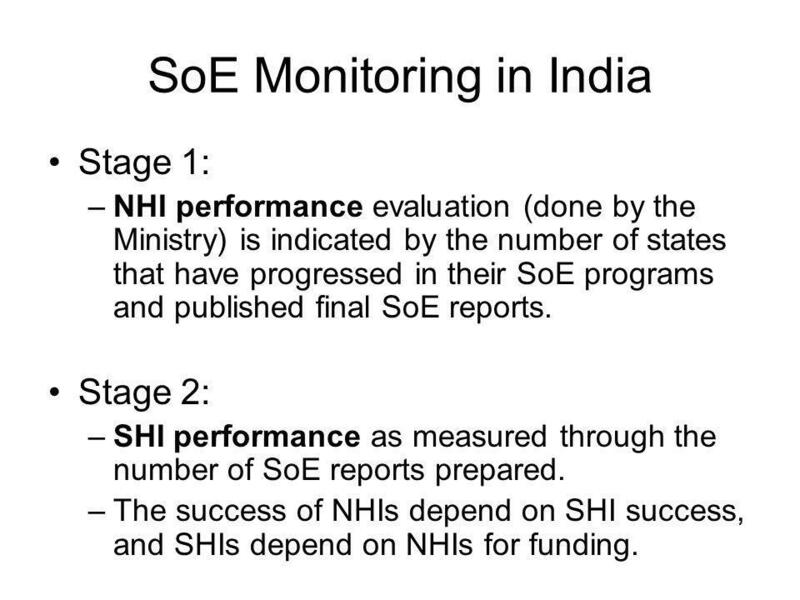 Stage 1: NHI performance evaluation (done by the Ministry) is indicated by the number of states that have progressed in their SoE programs and published final SoE reports. Stage 2: SHI performance as measured through the number of SoE reports prepared. The success of NHIs depend on SHI success, and SHIs depend on NHIs for funding. 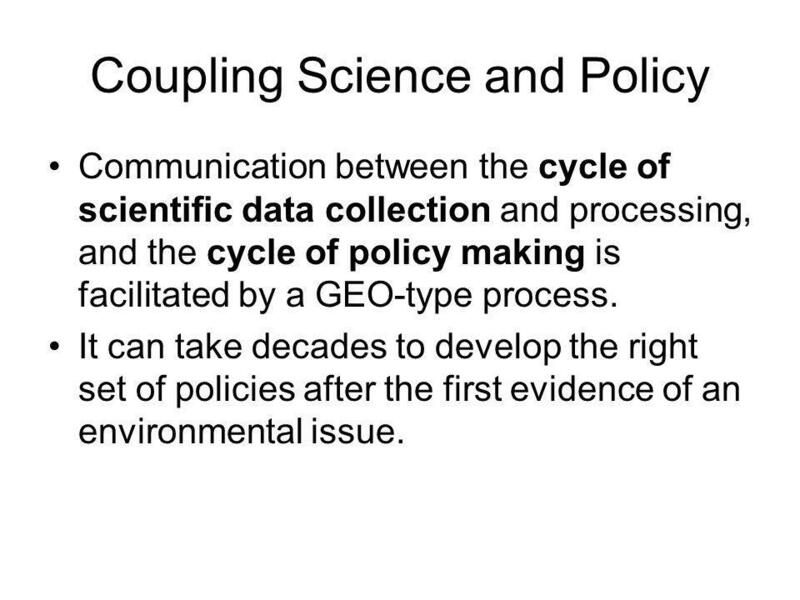 Communication between the cycle of scientific data collection and processing, and the cycle of policy making is facilitated by a GEO-type process. It can take decades to develop the right set of policies after the first evidence of an environmental issue. 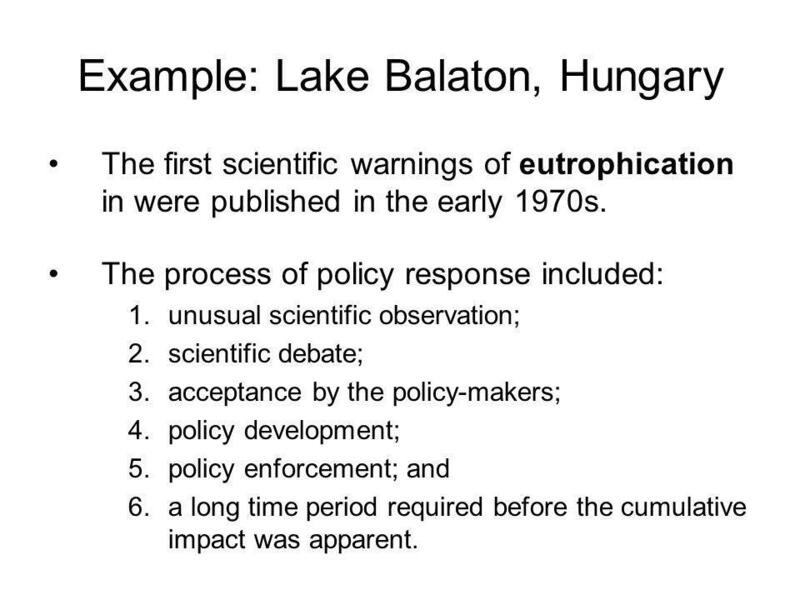 The first scientific warnings of eutrophication in were published in the early 1970s. 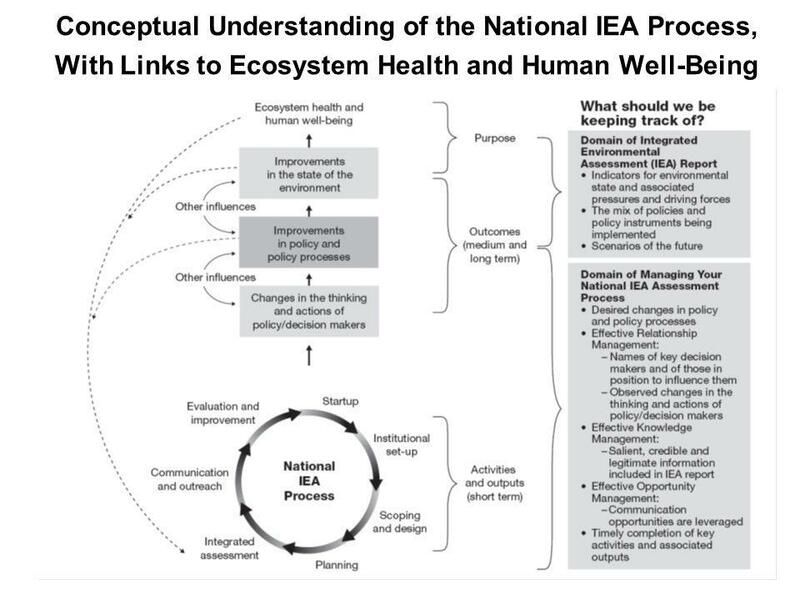 The process of policy response included: unusual scientific observation; scientific debate; acceptance by the policy-makers; policy development; policy enforcement; and a long time period required before the cumulative impact was apparent. 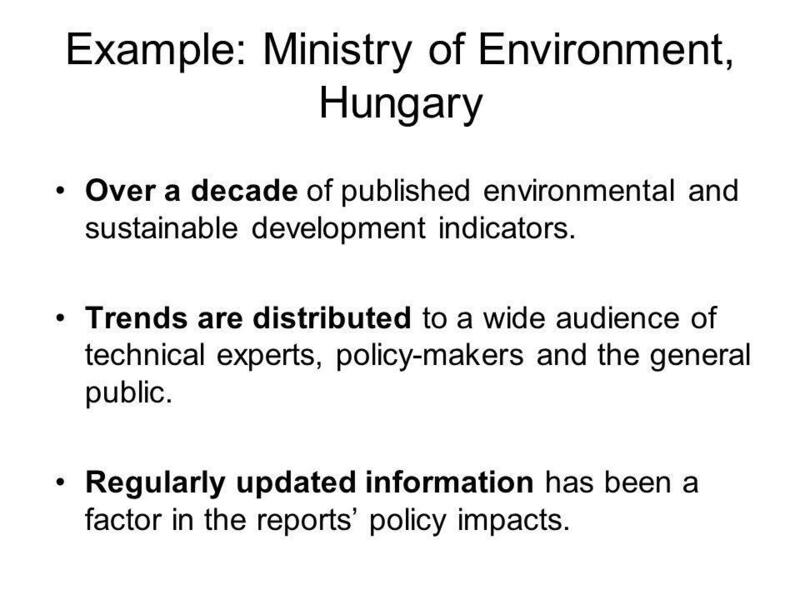 The UK government has been publishing environmental indicators since 1996. 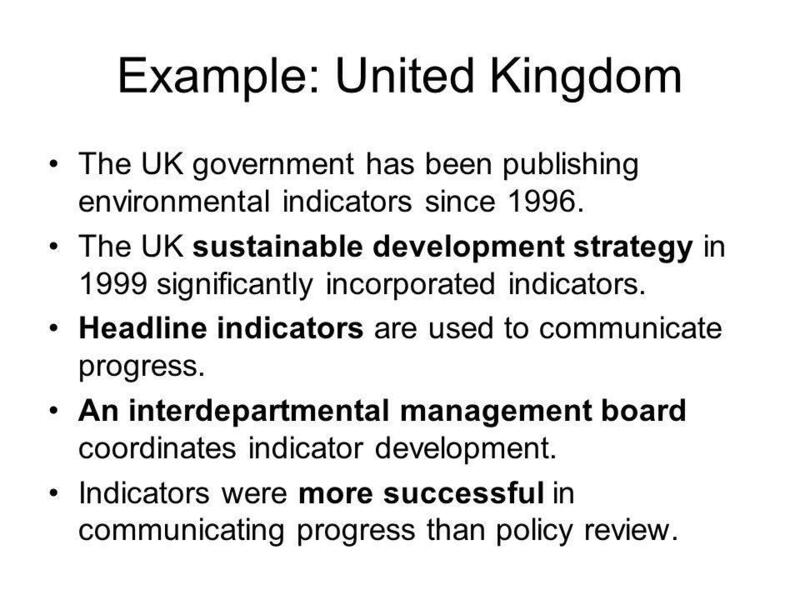 The UK sustainable development strategy in 1999 significantly incorporated indicators. Headline indicators are used to communicate progress. An interdepartmental management board coordinates indicator development. Indicators were more successful in communicating progress than policy review. Over a decade of published environmental and sustainable development indicators. Trends are distributed to a wide audience of technical experts, policy-makers and the general public. Regularly updated information has been a factor in the reports’ policy impacts. Do you know of other examples of how research-based evidence can guide policy making and lead to improvements? What are some examples in your country at the national level? Identifying your purpose. Identifying your primary users. 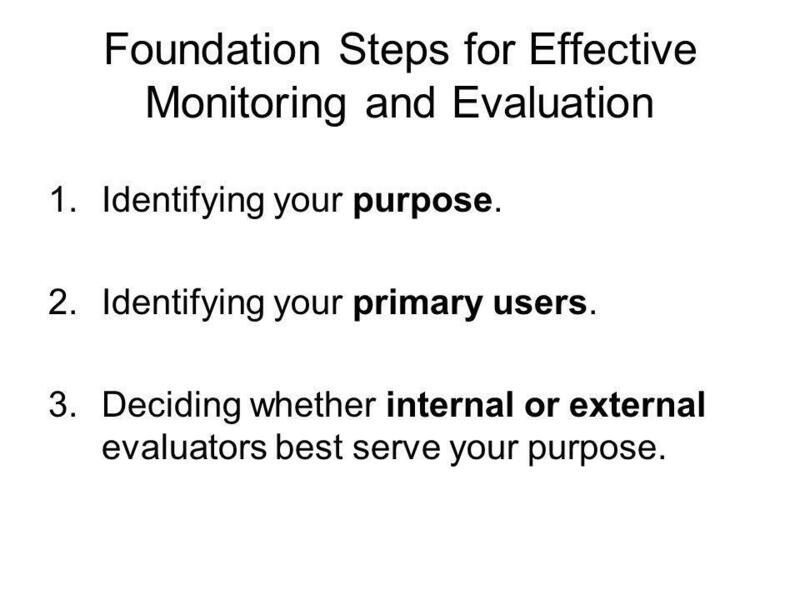 Deciding whether internal or external evaluators best serve your purpose. 24 1. 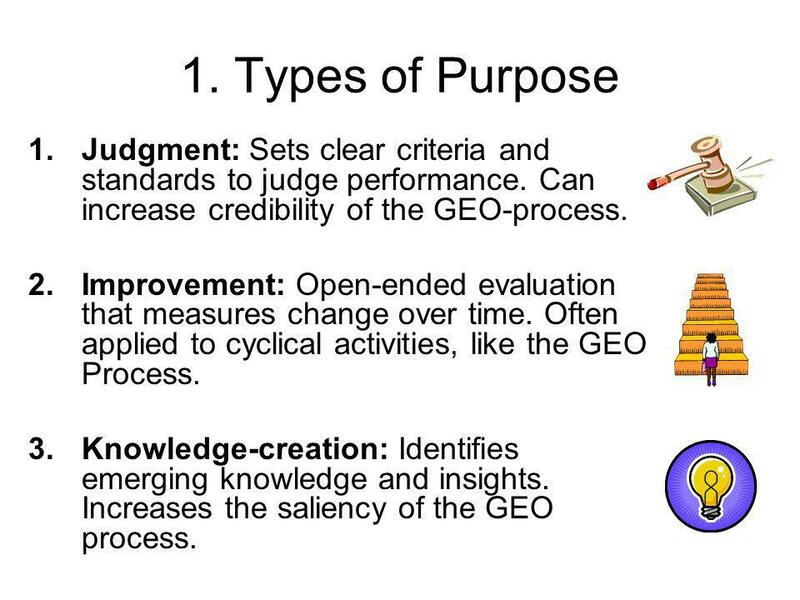 Types of Purpose Judgment: Sets clear criteria and standards to judge performance. 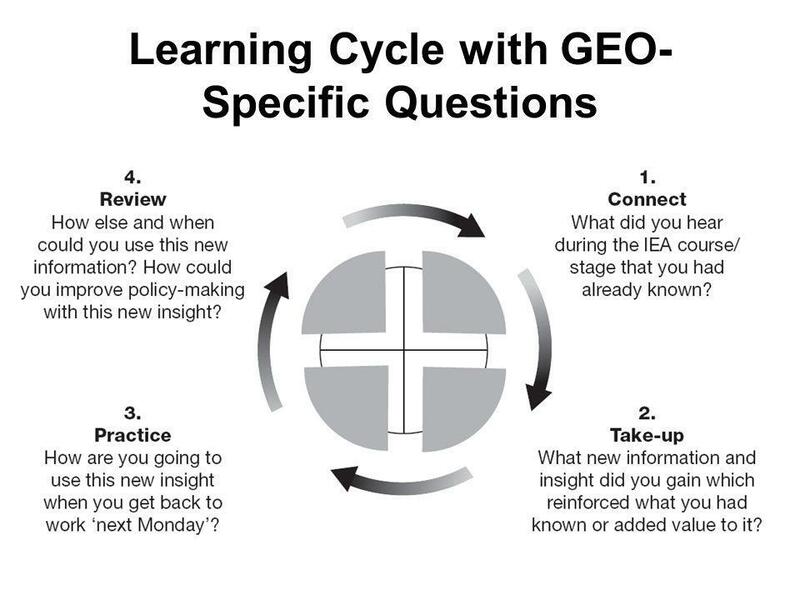 Can increase credibility of the GEO-process. 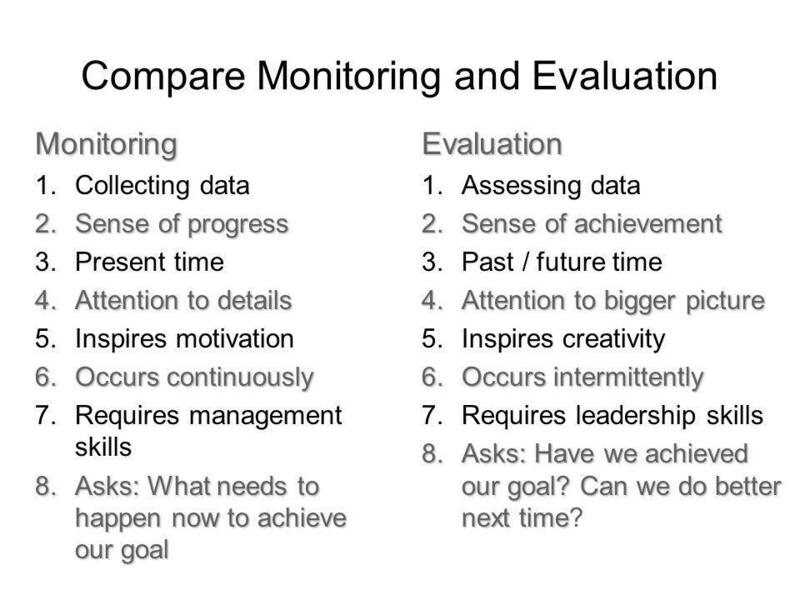 Improvement: Open-ended evaluation that measures change over time. 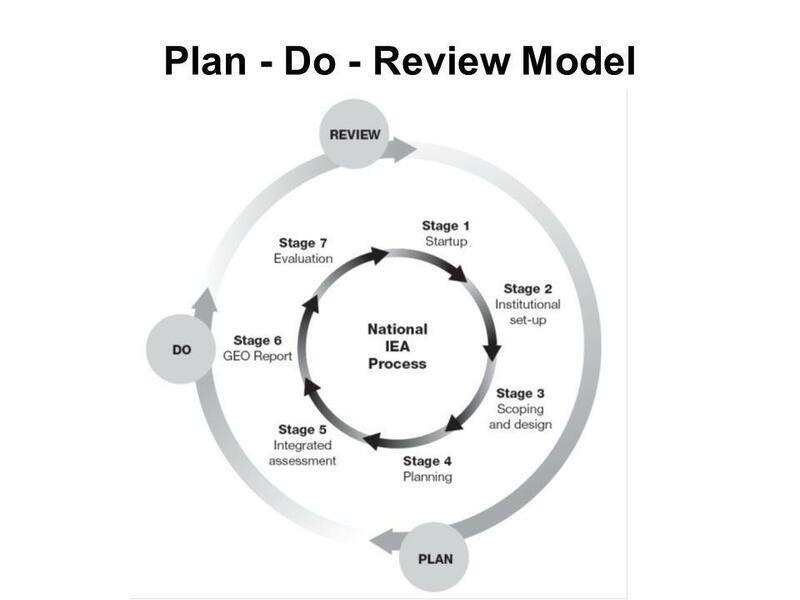 Often applied to cyclical activities, like the GEO Process. Knowledge-creation: Identifies emerging knowledge and insights. Increases the saliency of the GEO process. 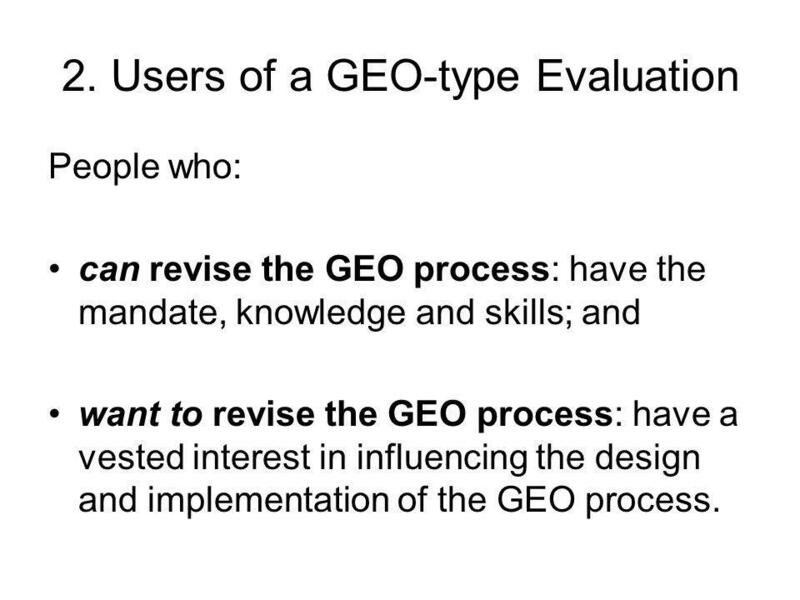 People who: can revise the GEO process: have the mandate, knowledge and skills; and want to revise the GEO process: have a vested interest in influencing the design and implementation of the GEO process. 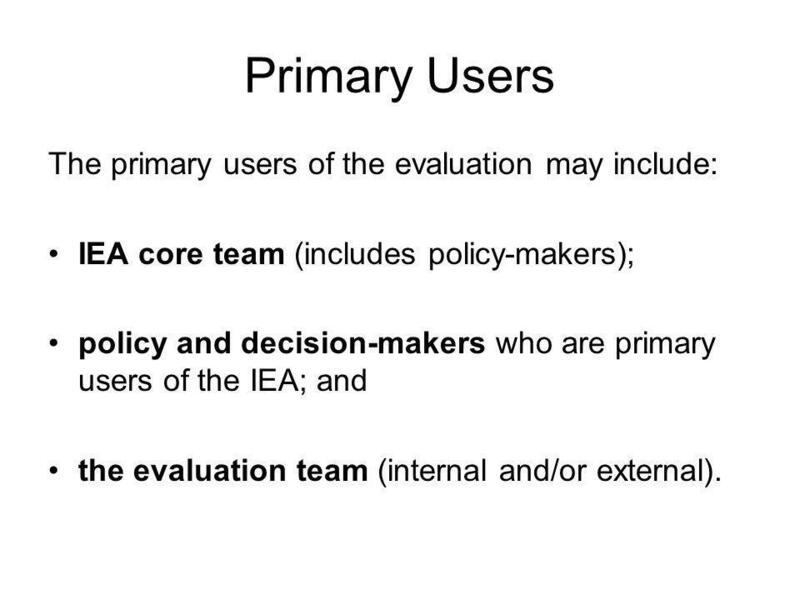 IEA core team (includes policy-makers); policy and decision-makers who are primary users of the IEA; and the evaluation team (internal and/or external). 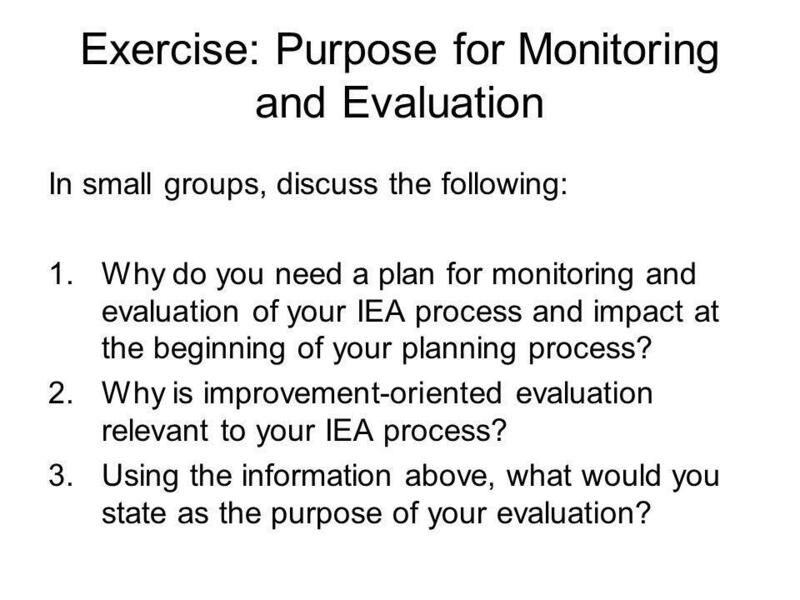 In small groups, discuss the following: Why do you need a plan for monitoring and evaluation of your IEA process and impact at the beginning of your planning process? 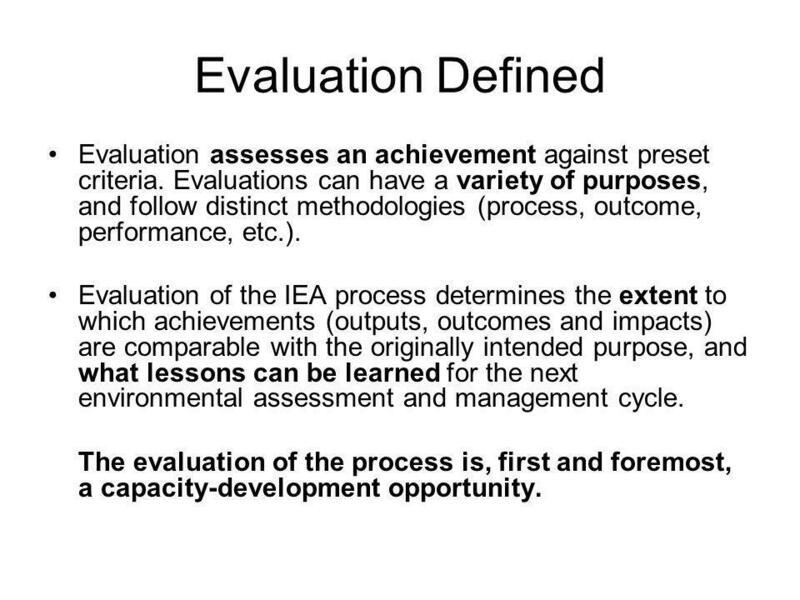 Why is improvement-oriented evaluation relevant to your IEA process? 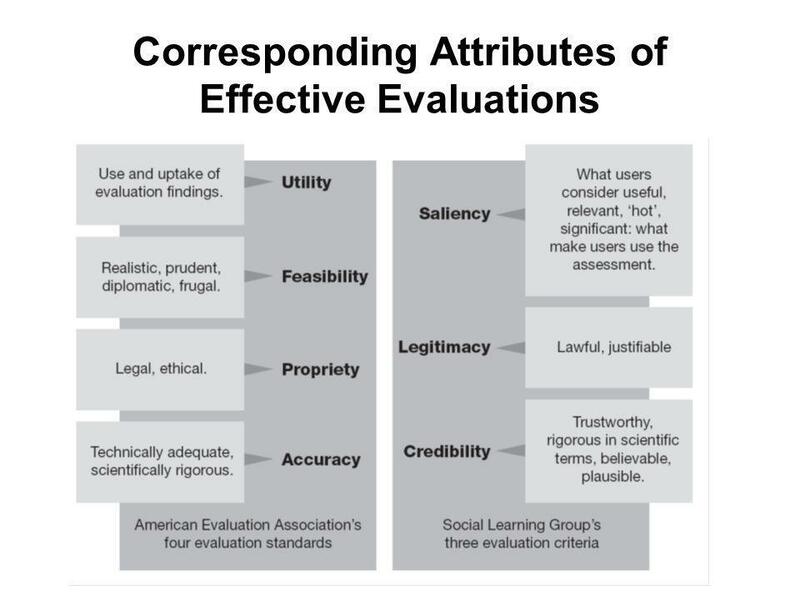 Using the information above, what would you state as the purpose of your evaluation? 28 Exercise: Continued 4. Who are potential users? 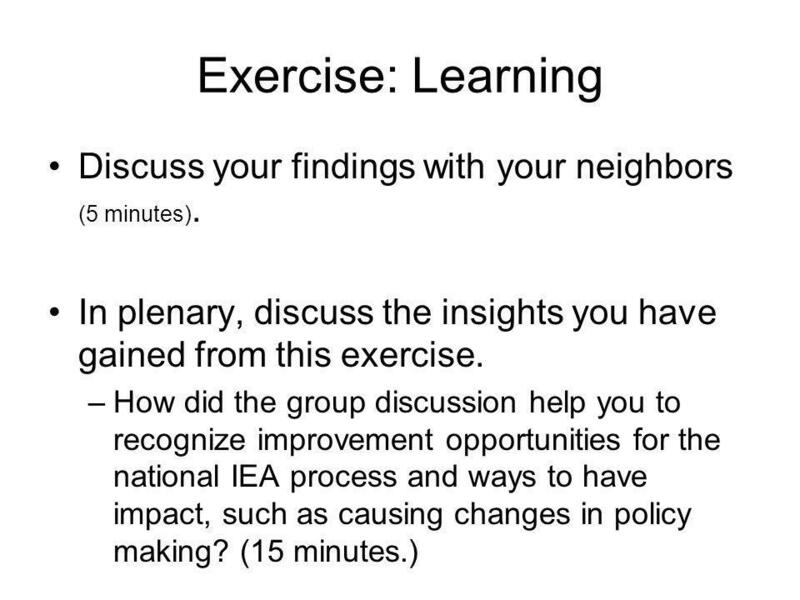 A small internal evaluation task force (including the IEA core team, which is recommended). 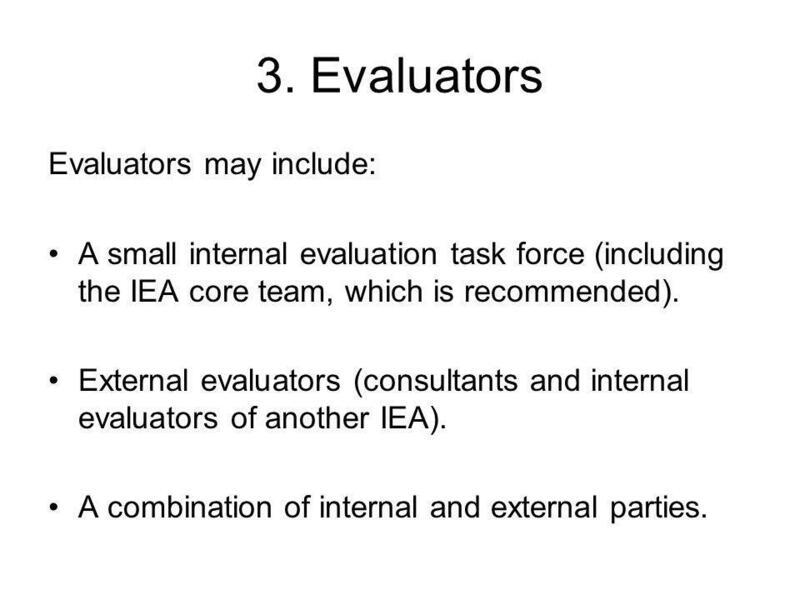 External evaluators (consultants and internal evaluators of another IEA). A combination of internal and external parties. 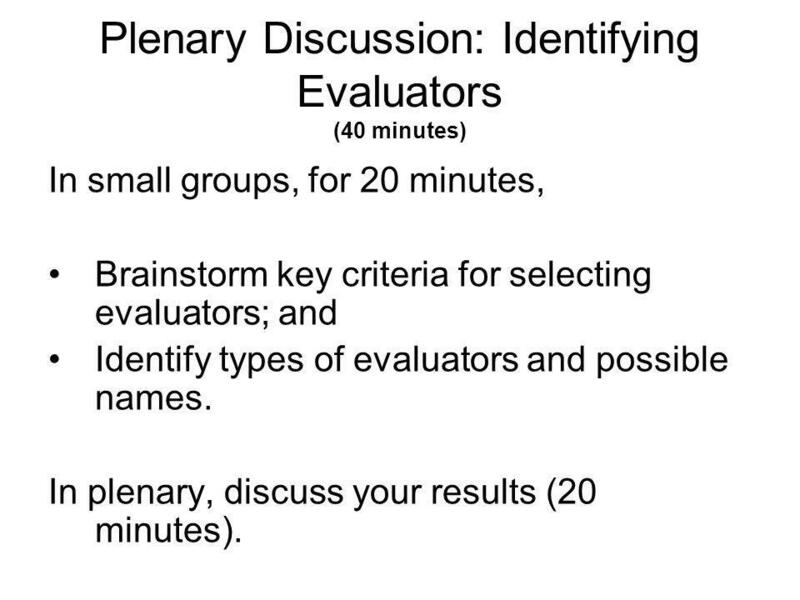 In small groups, for 20 minutes, Brainstorm key criteria for selecting evaluators; and Identify types of evaluators and possible names. 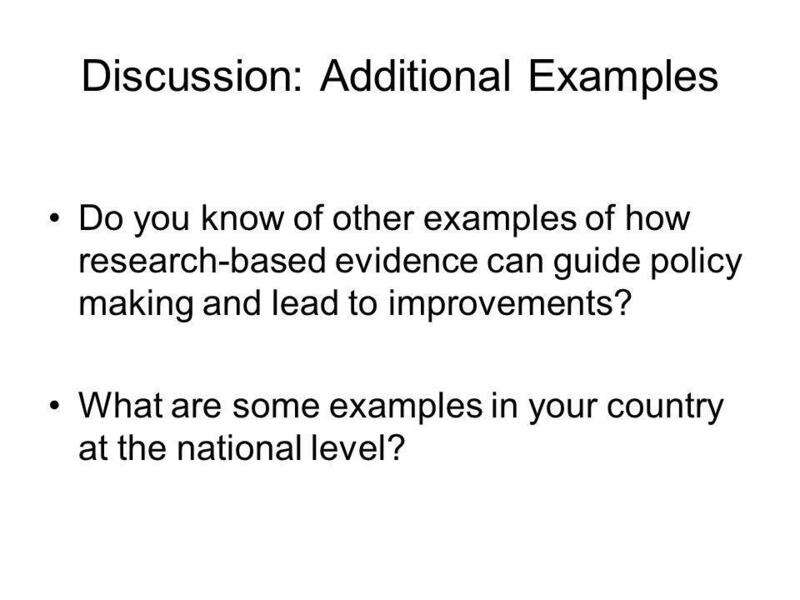 In plenary, discuss your results (20 minutes). 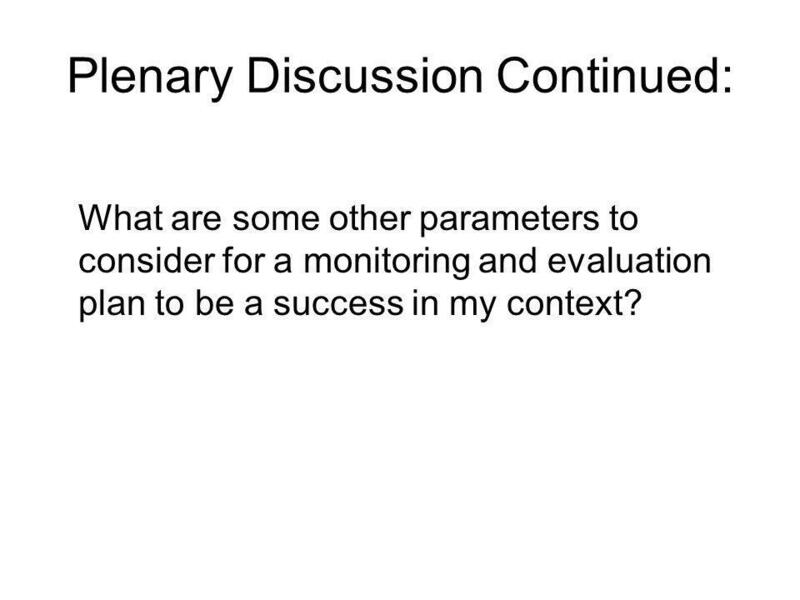 What are some other parameters to consider for a monitoring and evaluation plan to be a success in my context? 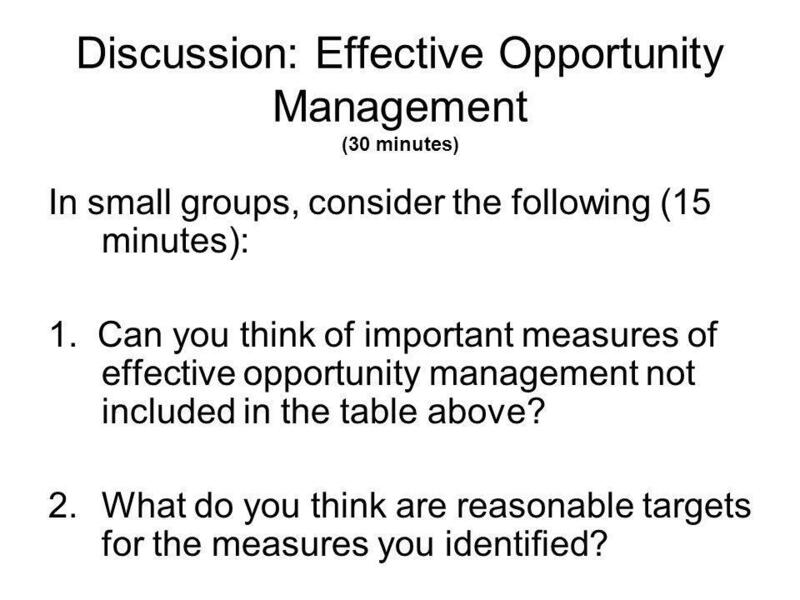 In small groups, consider the following (15 minutes): 1. 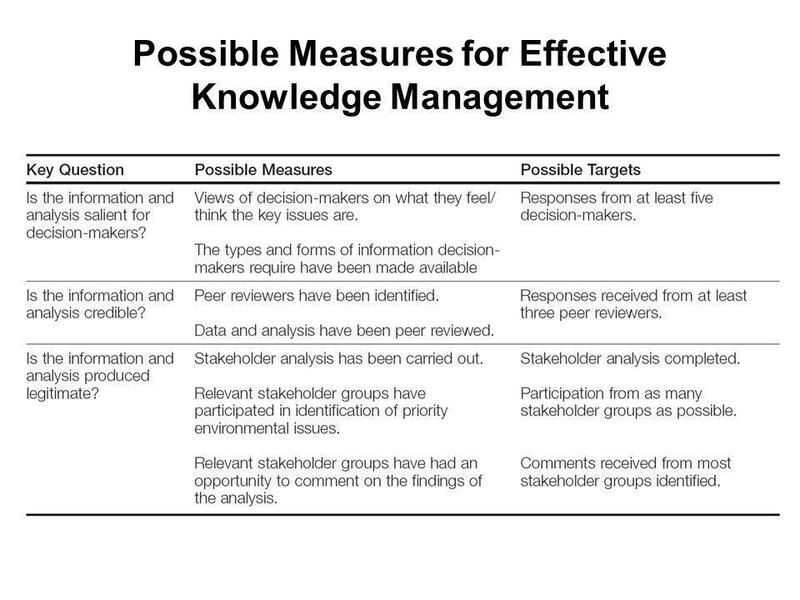 Can you think of additional important measures of effective knowledge management? What do you think are reasonable targets for the measures you identified? 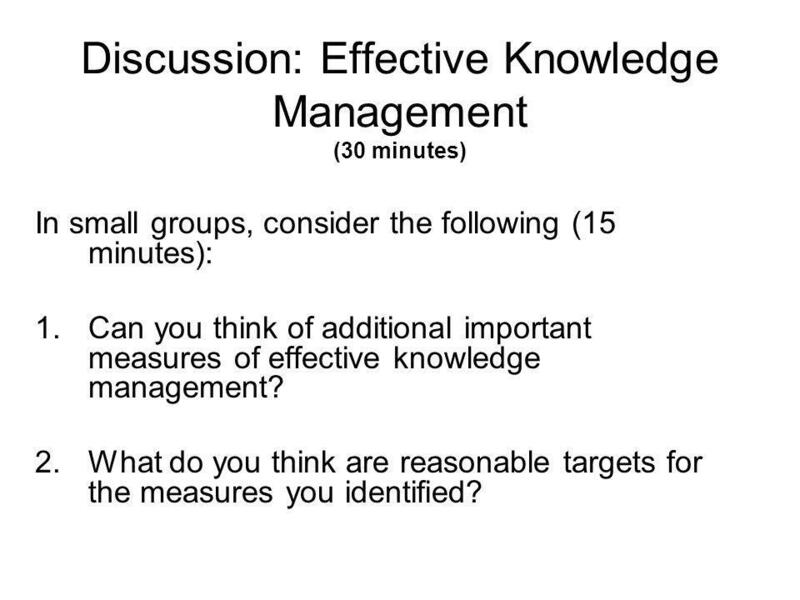 In small groups, consider the following (15 minutes): 1. 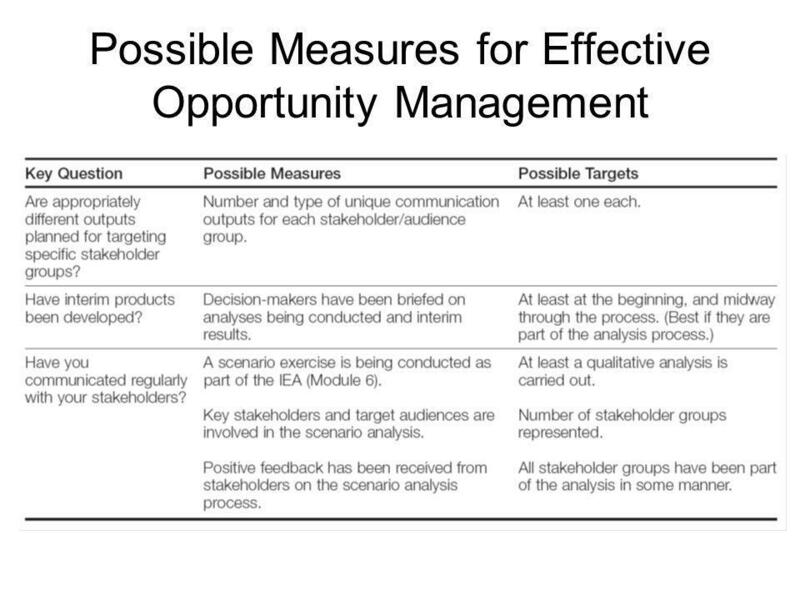 Can you think of important measures of effective opportunity management not included in the table above? What do you think are reasonable targets for the measures you identified? 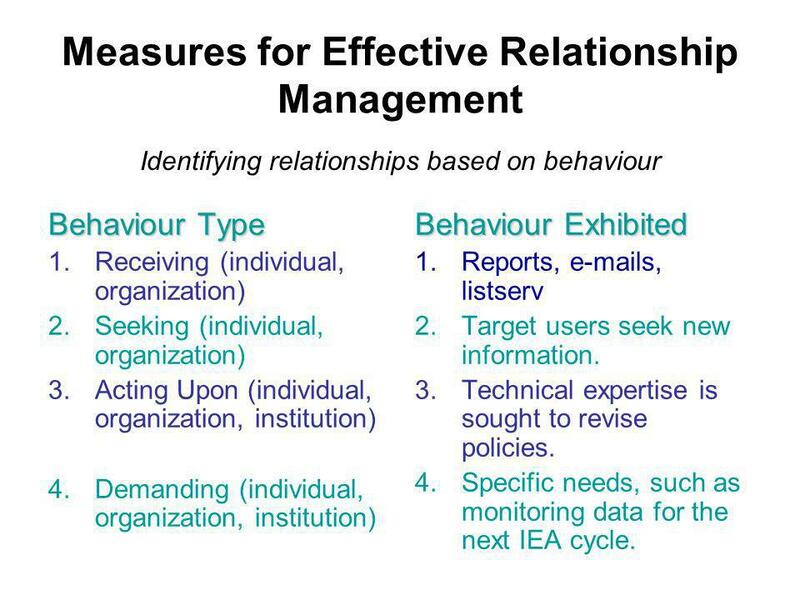 Identifying relationships based on behaviour Behaviour Type Receiving (individual, organization) Seeking (individual, organization) Acting Upon (individual, organization, institution) Demanding (individual, organization, institution) Behaviour Exhibited Reports, s, listserv Target users seek new information. Technical expertise is sought to revise policies. Specific needs, such as monitoring data for the next IEA cycle. 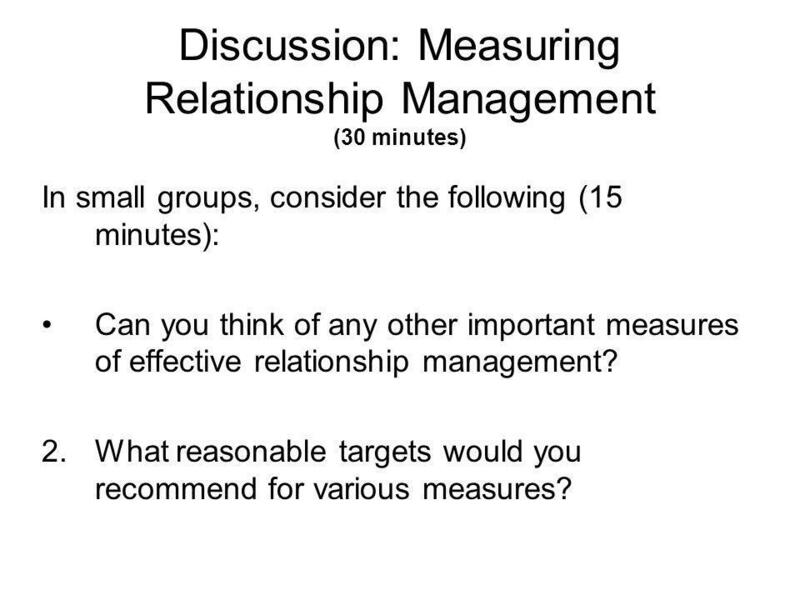 In small groups, consider the following (15 minutes): Can you think of any other important measures of effective relationship management? What reasonable targets would you recommend for various measures? 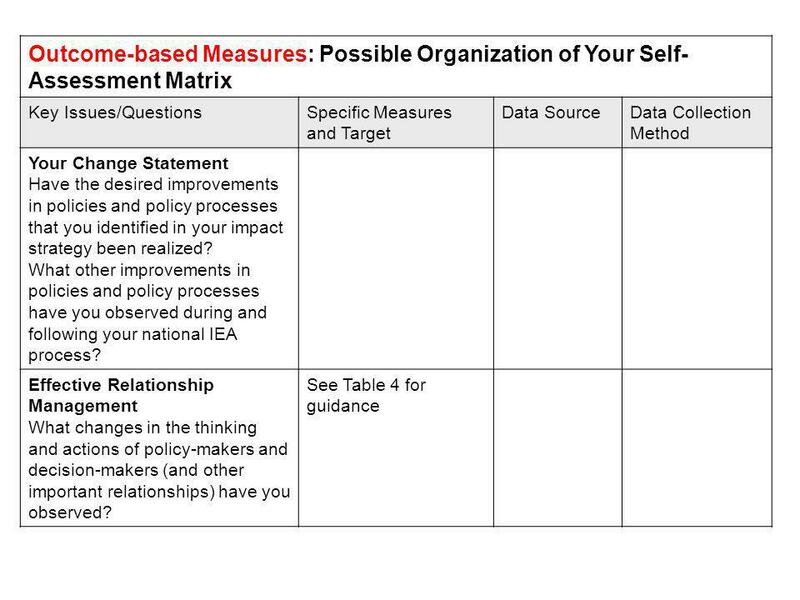 Measurement should relate to the change statement you identified in your impact strategy. 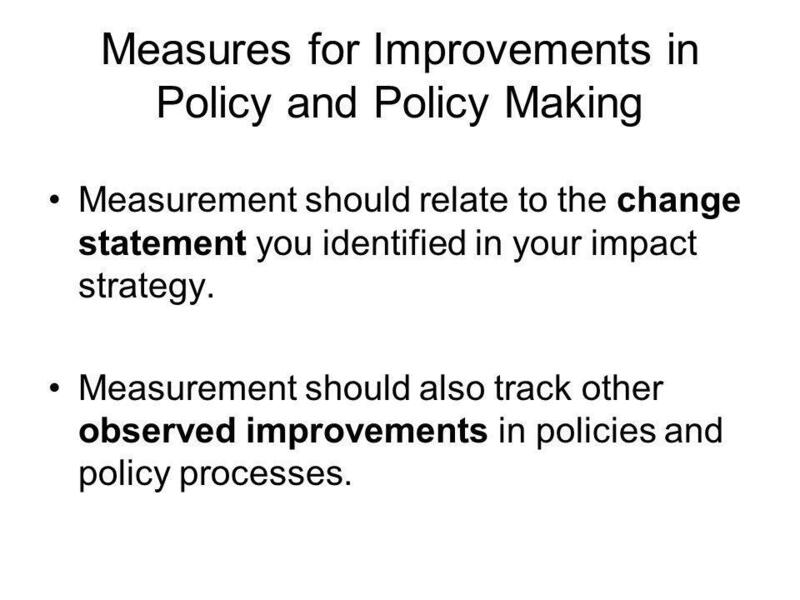 Measurement should also track other observed improvements in policies and policy processes. Requires that changes in behavior be identified and mapped: these incremental changes will lead towards the decisions or changes you are seeking. 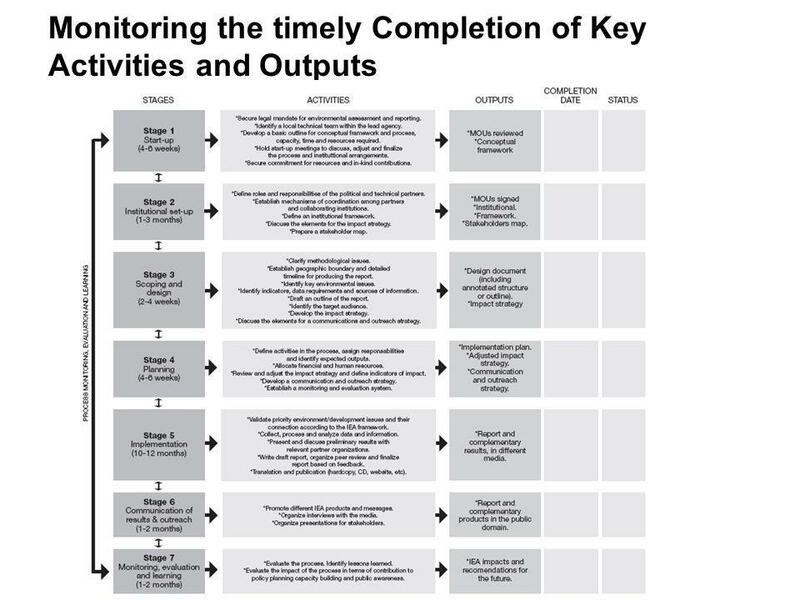 Can be a time intensive process, so it is important to set up simple ways to monitor your strategy against those measures. Can set up a small contacts database with a journaling function (see next slide). Ensure that critical indicators are monitored. Establish the frequency of monitoring for each indicator. 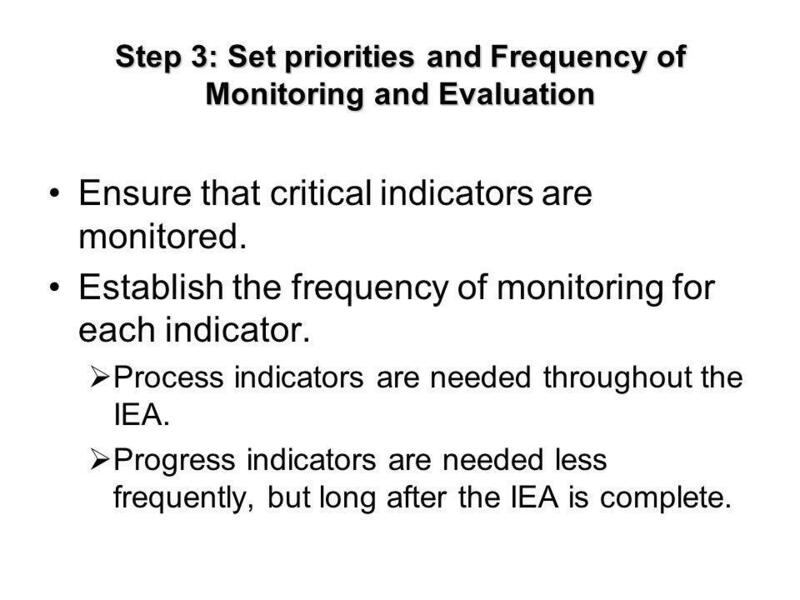 Process indicators are needed throughout the IEA. 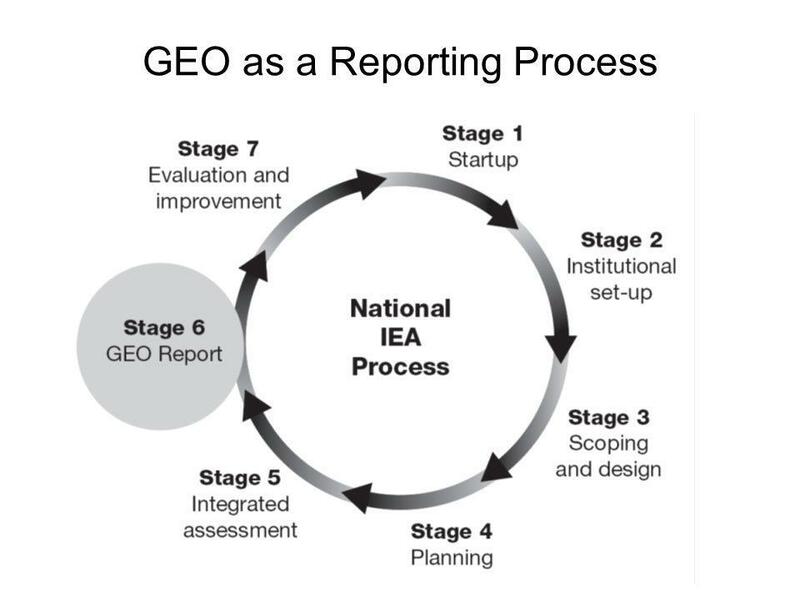 Progress indicators are needed less frequently, but long after the IEA is complete. Form working groups of 4–5 persons. 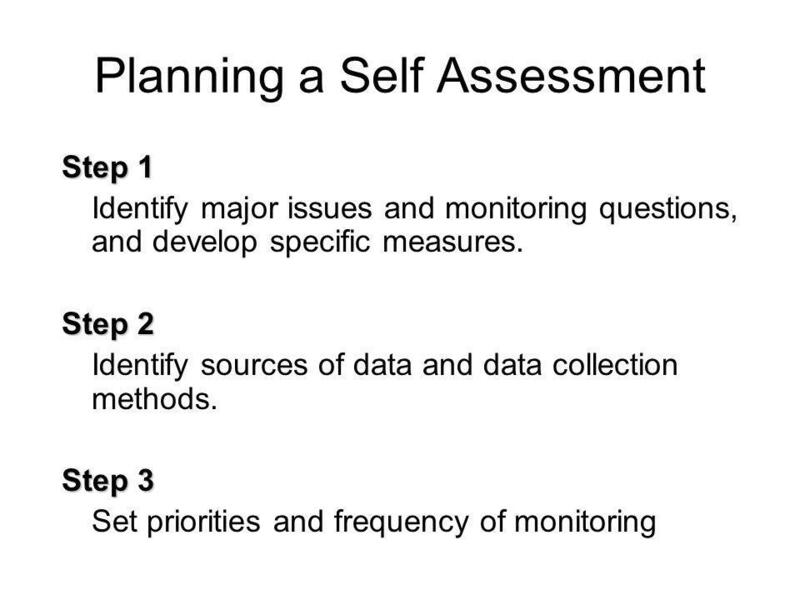 Complete steps 1–3 for preparing a self-assessment matrix. 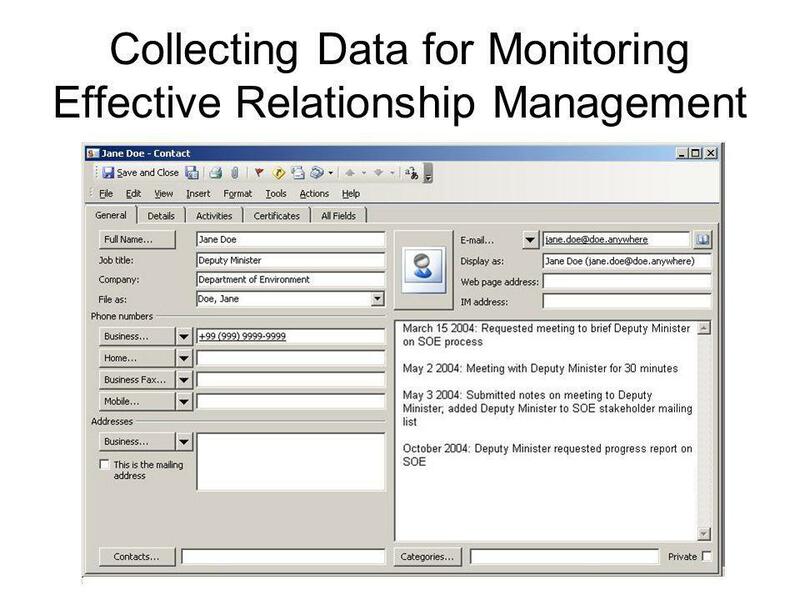 Step 1: Identify major issues and monitoring questions, and develop specific measures. For activity and output-based measures, assign different stages to different groups and compile in plenary. 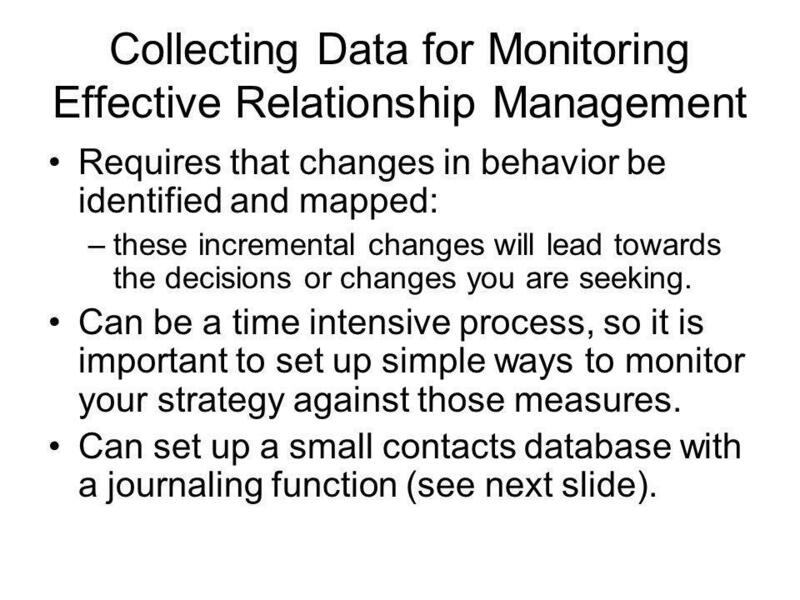 Step 2: Identify sources of data and data collection methods. 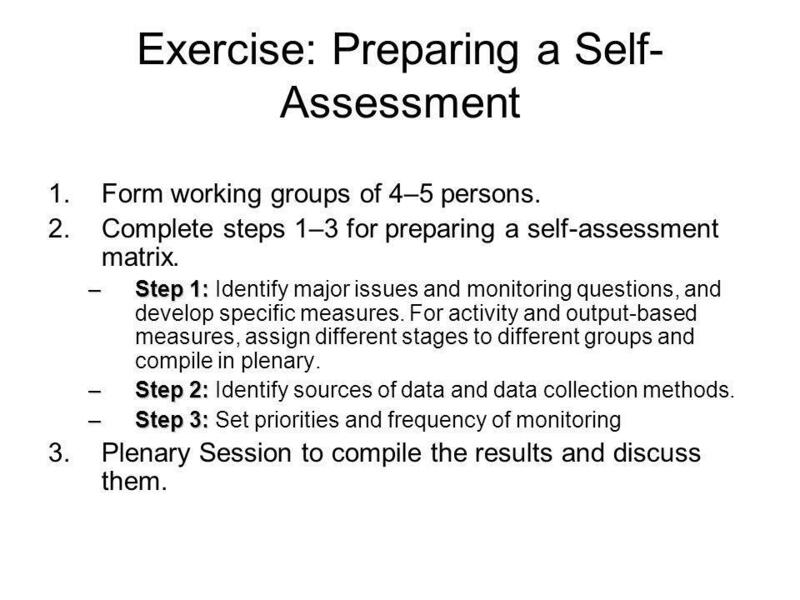 Step 3: Set priorities and frequency of monitoring Plenary Session to compile the results and discuss them. 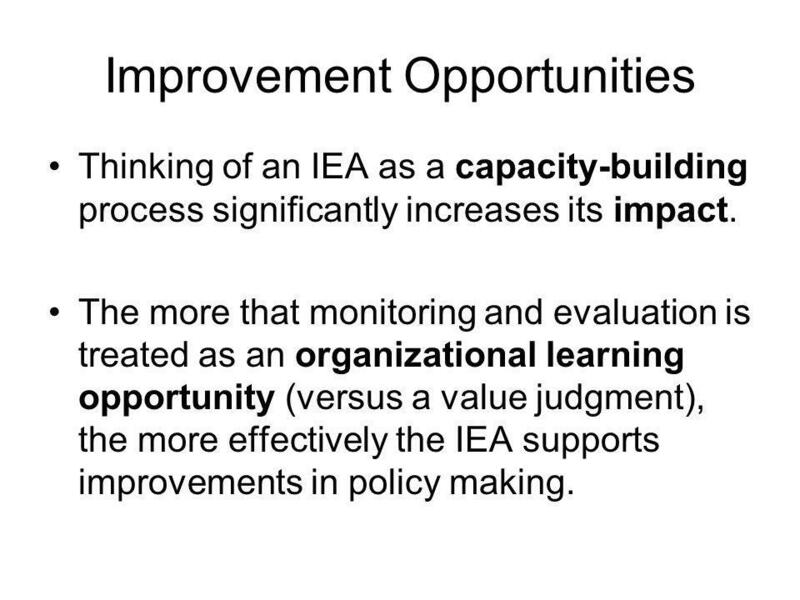 Thinking of an IEA as a capacity-building process significantly increases its impact. 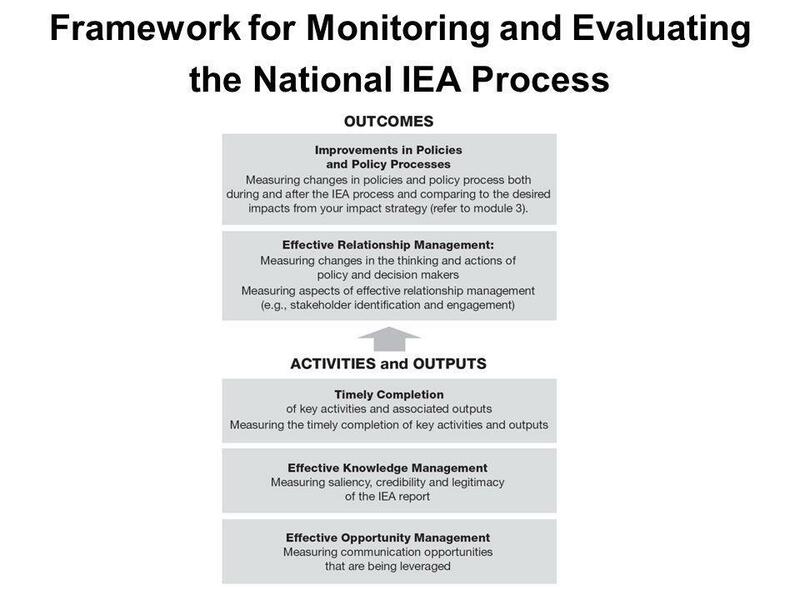 The more that monitoring and evaluation is treated as an organizational learning opportunity (versus a value judgment), the more effectively the IEA supports improvements in policy making. Think of the last time you learned something new. What was it, how did you learn it and what did you do differently as a result? 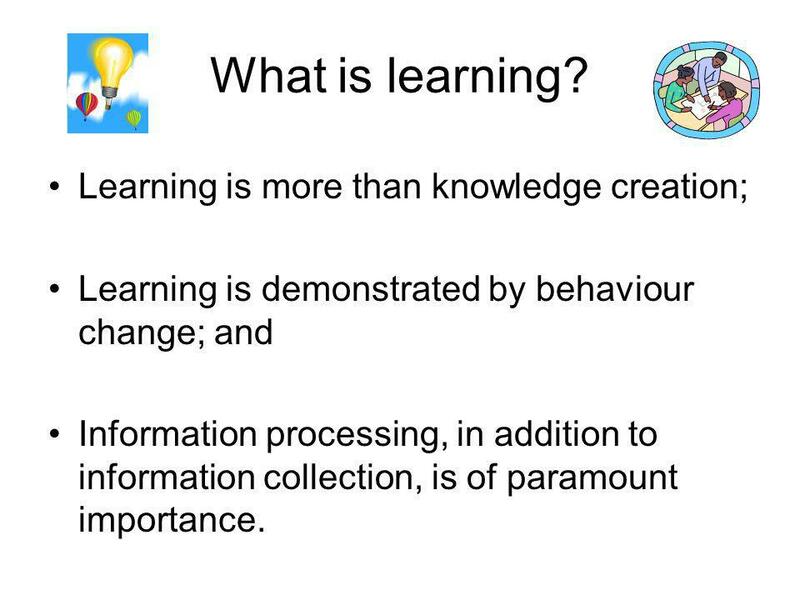 Learning is demonstrated by behaviour change; and Information processing, in addition to information collection, is of paramount importance. 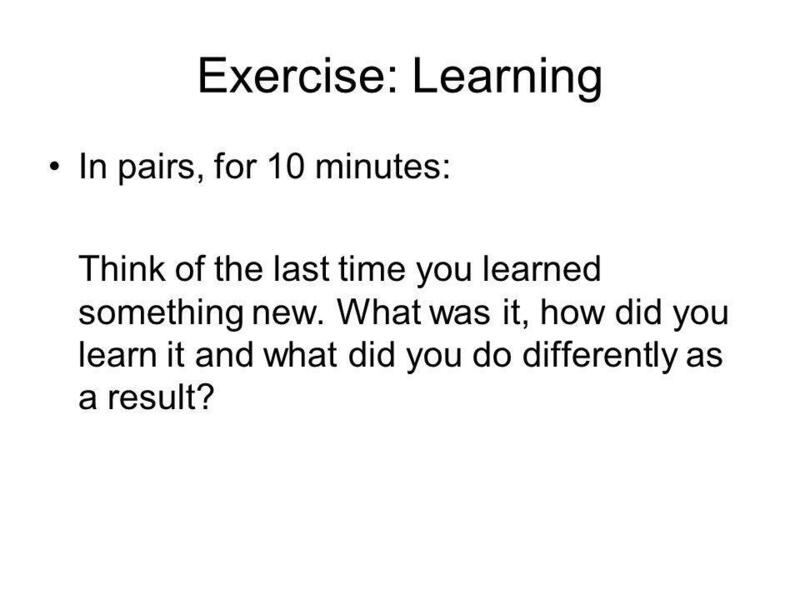 60 Exercise: Learning A. Write what comes to mind based on the following four questions (5 minutes): 1. 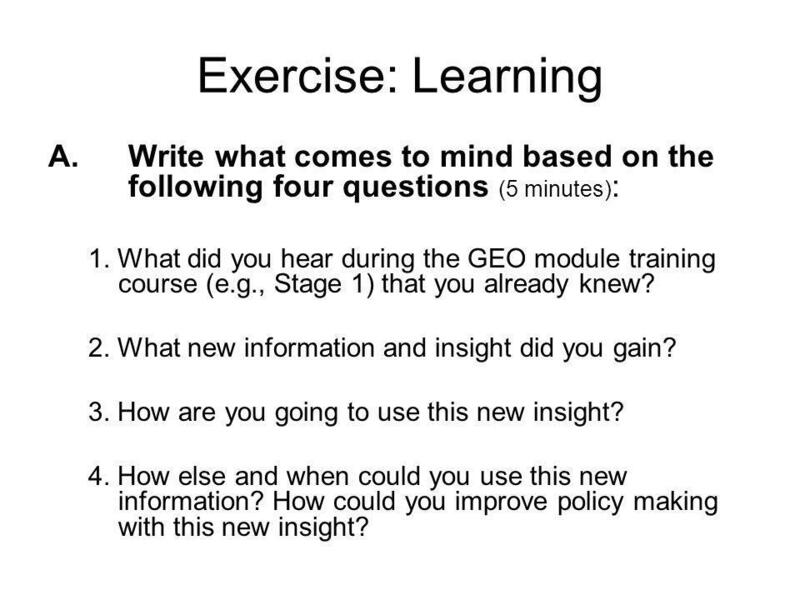 What did you hear during the GEO module training course (e.g., Stage 1) that you already knew? 2. What new information and insight did you gain? 3. How are you going to use this new insight? 4. How else and when could you use this new information? How could you improve policy making with this new insight? 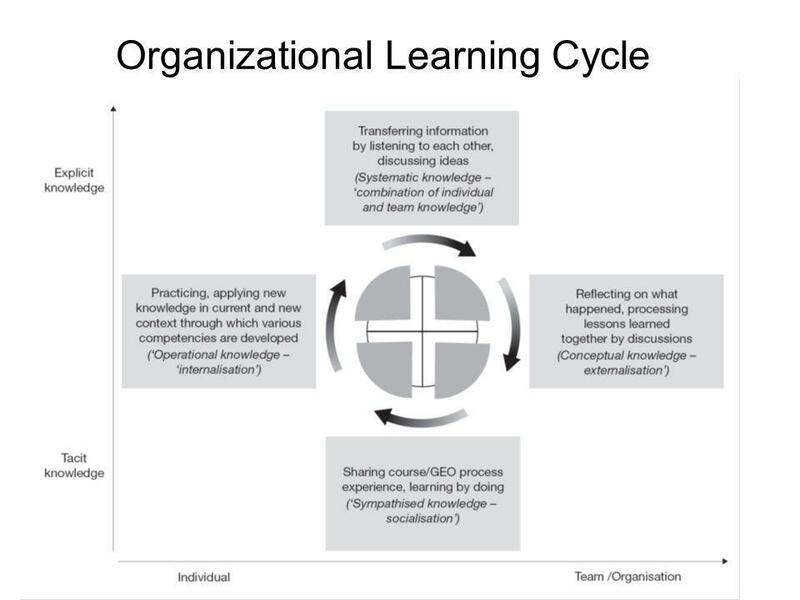 motivation, which often is the urgency to solve a problem, or act with the support of new knowledge; trust to discuss values, assumptions and ideas without repercussions; mandate and opportunity to apply the new knowledge; and shared understanding of the importance of learning (not only what to learn but also how to learn). 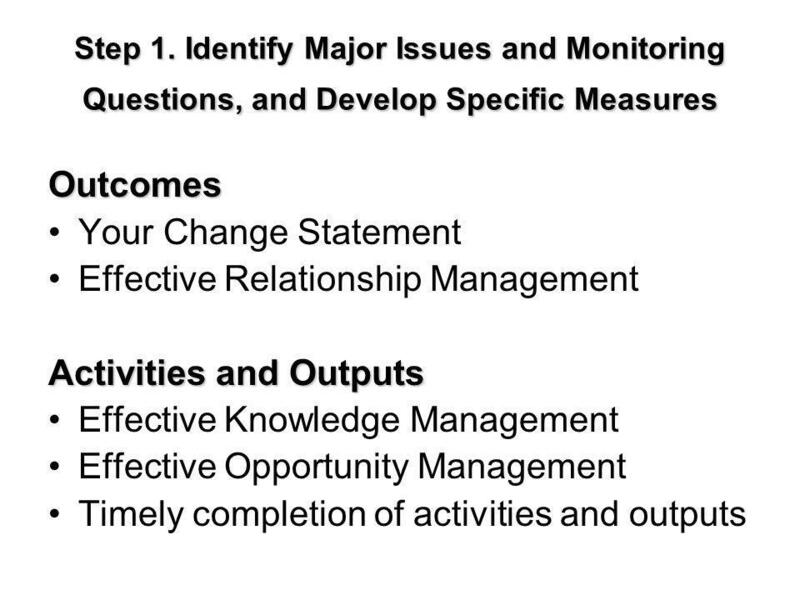 Formulate your change statement (Module 3). 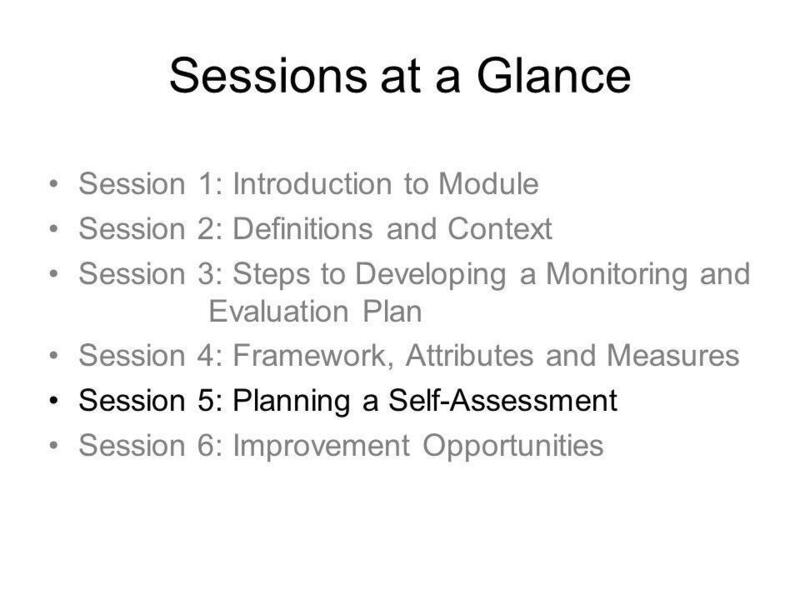 Identify measures for your change statement and other supporting measures for key outcomes and activities/outputs (Module 8, Tables 8 and 9) Examine performance against making the desired changes and summarize results Formulate recommendations and lessons learned. Integrate (feedback) recommendations and lessons learned to improve the next planning cycle and other decisions. 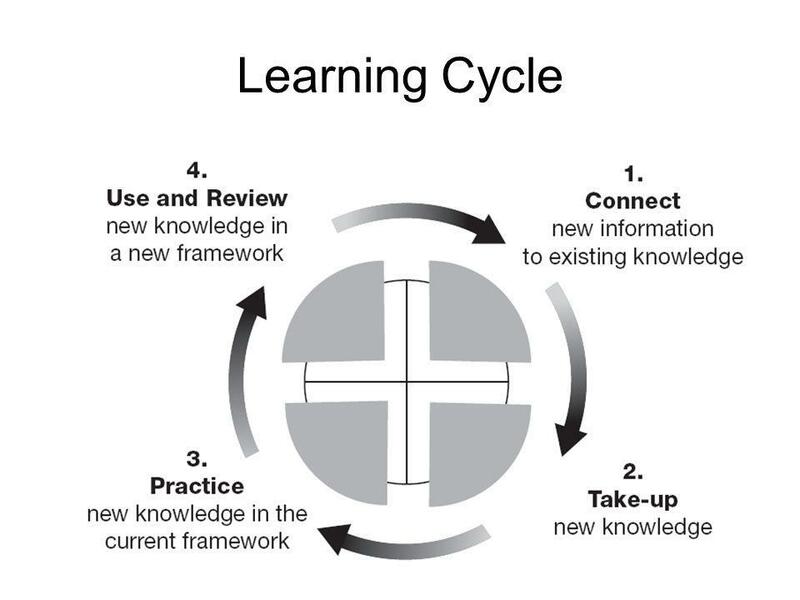 Learning opportunities naturally present themselves at the beginning and end of each IEA stage and each IEA cycle. These are the times when you need to reflect and articulate lessons learned to improve the next course of action. 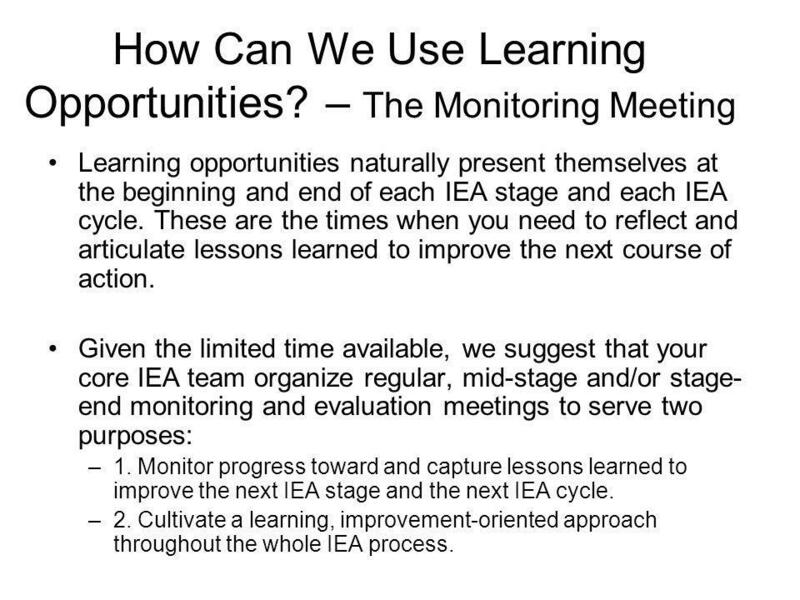 Given the limited time available, we suggest that your core IEA team organize regular, mid-stage and/or stage-end monitoring and evaluation meetings to serve two purposes: 1. 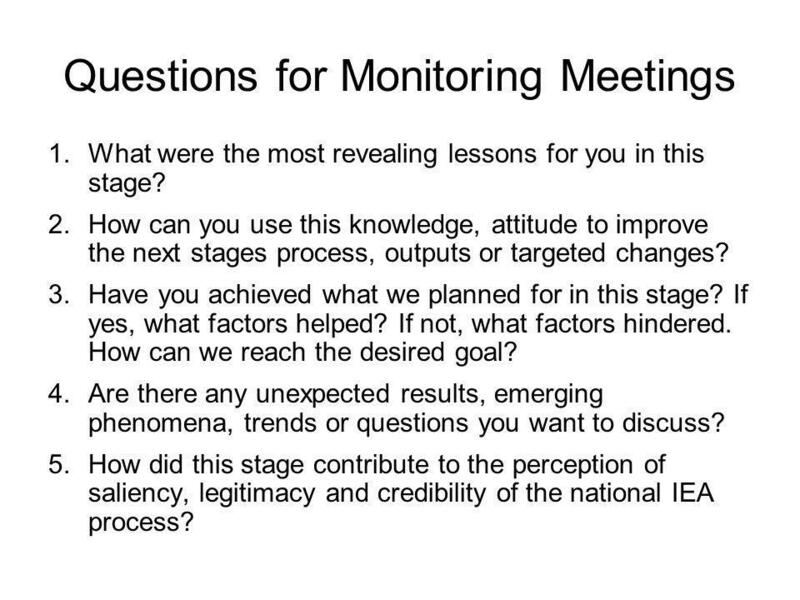 Monitor progress toward and capture lessons learned to improve the next IEA stage and the next IEA cycle. 2. 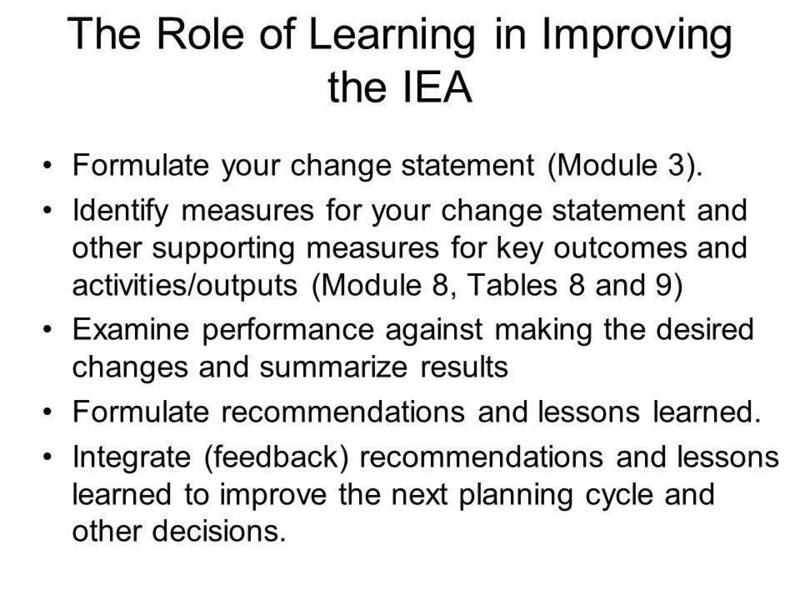 Cultivate a learning, improvement-oriented approach throughout the whole IEA process. What were the most revealing lessons for you in this stage? How can you use this knowledge, attitude to improve the next stages process, outputs or targeted changes? Have you achieved what we planned for in this stage? If yes, what factors helped? If not, what factors hindered. How can we reach the desired goal? Are there any unexpected results, emerging phenomena, trends or questions you want to discuss? 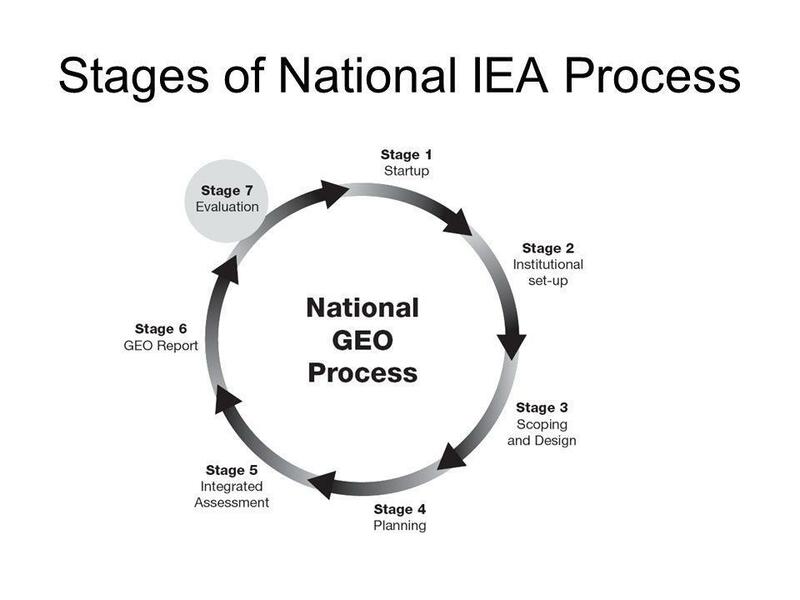 How did this stage contribute to the perception of saliency, legitimacy and credibility of the national IEA process? 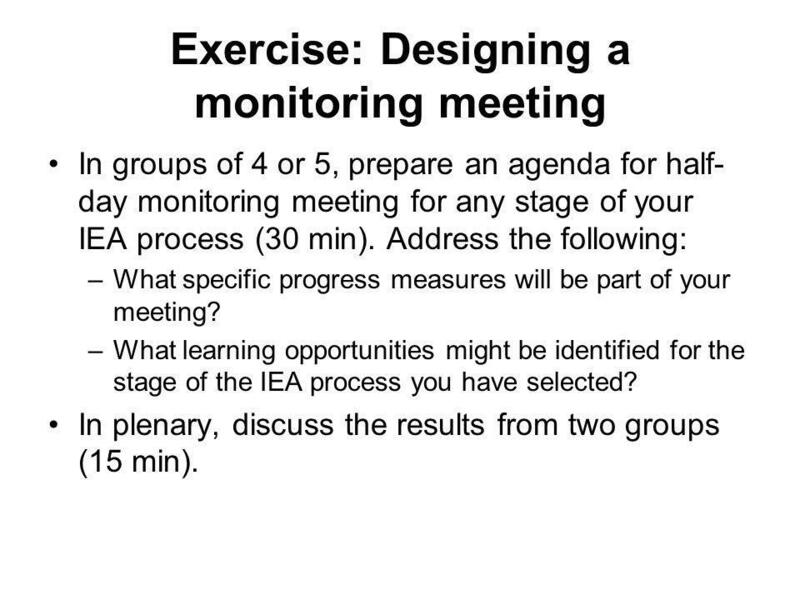 In groups of 4 or 5, prepare an agenda for half-day monitoring meeting for any stage of your IEA process (30 min). Address the following: What specific progress measures will be part of your meeting? 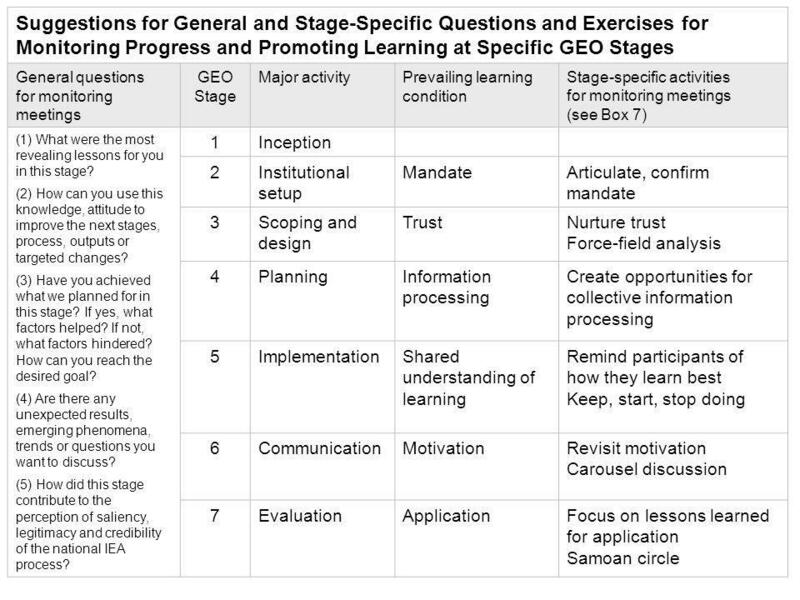 What learning opportunities might be identified for the stage of the IEA process you have selected? 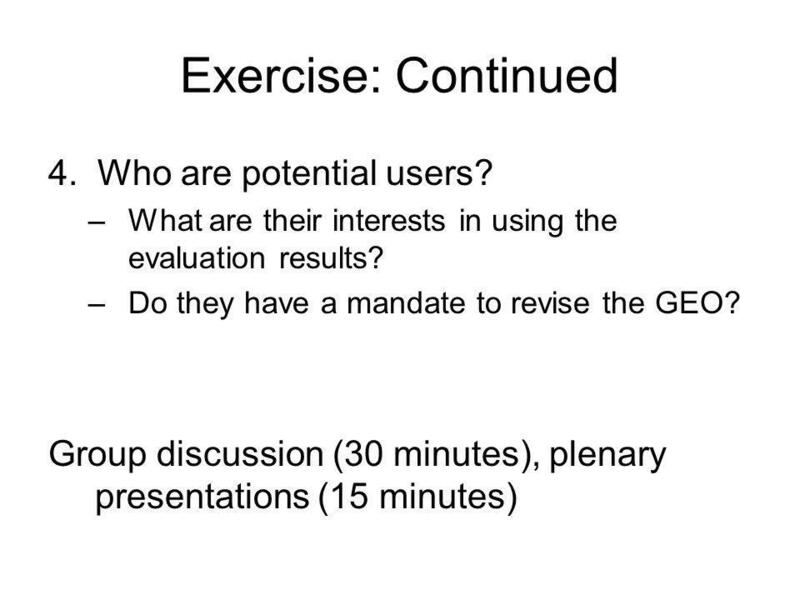 In plenary, discuss the results from two groups (15 min). 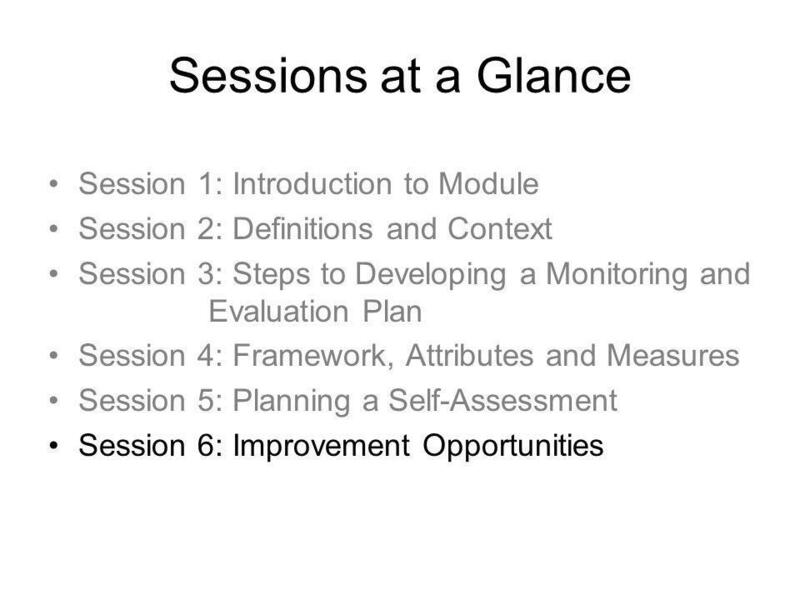 Download ppt "Module 8: Monitoring, evaluation and learning – for increased impact and improvement of the IEA process." 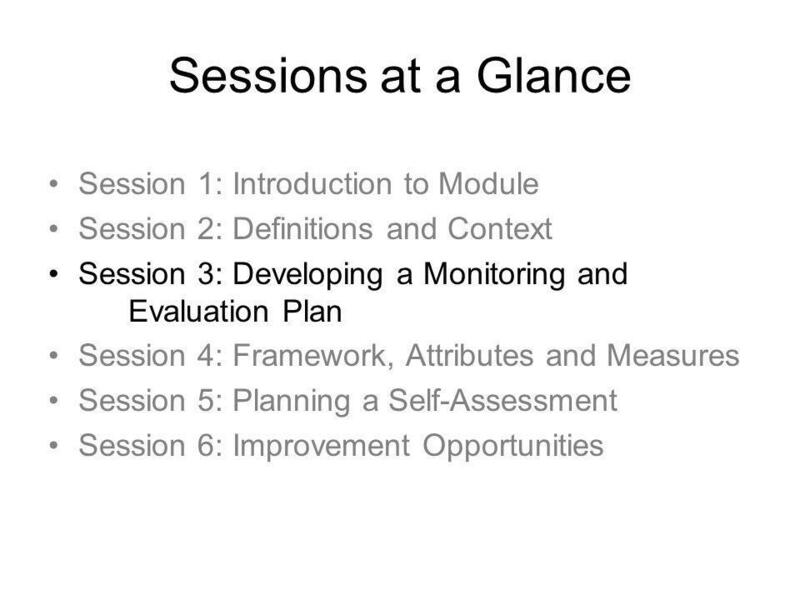 Division Of Early Warning And Assessment MODULE 11: ASSESSING THE FUTURE. Division Of Early Warning And Assessment MODULE 9: LINKING INTEGRATED ENVIRONMENTAL ASSESSMENT TO POLICY. Ray C. Rist The World Bank Washington, D.C.
Building & Leading Teams for Impact December 20, 2011. Decision-Making and Strategic Information Workshop on M&E of PHN Programs July 24-August 11, 2006 Addis Ababa.